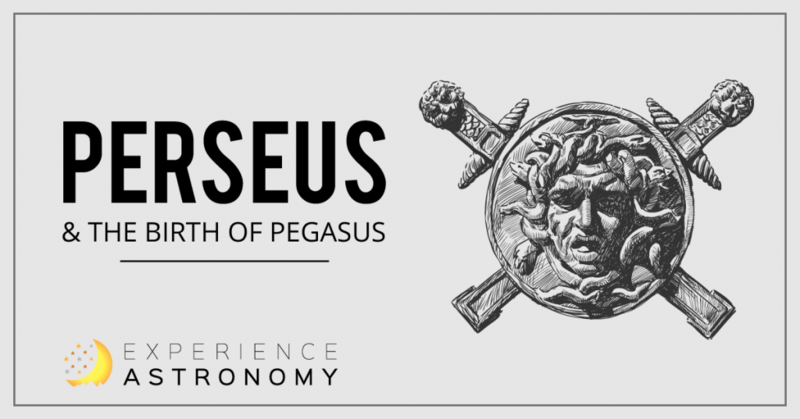 So, you want to know how the constellation Pegasus came to be? Well, for you to know that, I’ll have to tell you one of my stories. 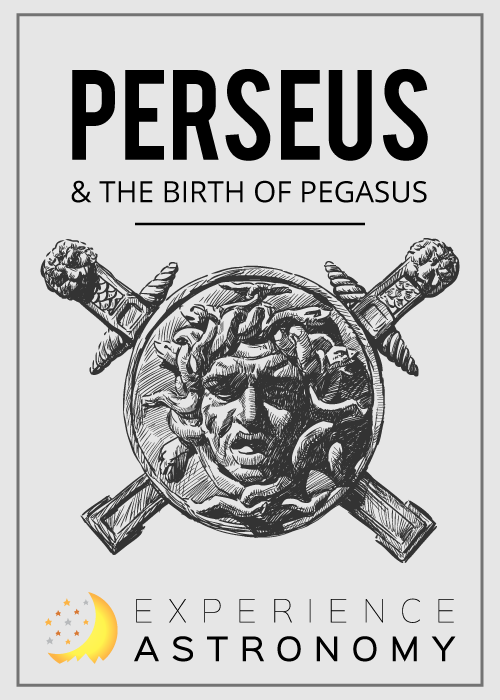 When I, Perseus, was a young lad living in the realm of King Polydectes, the King sent word to me and my Mother Danae that I was to leave his kingdom and not return until I brought him the head of the Gorgon Medusa, whose gaze turned all to stone. When I heard the news, I prayed to my father Zeus for help. He answered my prayers by coming down to earth and bringing his fellow god Hermes and goddess Athena with him. When I saw them my heart leapt, for each of them had brought me a gift to help me on my journey. Lord Hermes lent me his flying sandals. Lady Athena gave me a highly polished shield. And Zeus, my Father, gave me a sword of my very own. Feeling more confident than before, I put on Hermes’ winged shoes and set off on my journey. It wasn’t long before I saw the island on which the hideous form of Medusa was sleeping. I laughed to myself. It was so simple! All I had to do was walk up and cut off her head as she slept. My feet hit land, and I crept slowly up to the sleeping Medusa. I was only a few feet away when I raised my sword—then everything went wrong. You see, where her hair should have been, there were hundreds of live, writhing snakes. But while Medusa slept, the snakes did not! As I raised my sword, one of those foul beasts nudged her shoulder. Knowing what would happen a second before it did, I jumped behind a boulder. Desperately, I unsheathed my sword, and pulled out Athena’s shield. The shield! By looking in the reflection of the shield, I could avoid being petrified by her, and still fight! I leapt from my hiding place. Medusa lunged. I side-stepped her, then with a great stroke of my sword, I brought her head tumbling down to earth. From her neck sprang a huge form: Chrysaor, a giant wielding a golden sword. I turned back to Medusa’s body just in time to see a white, winged stallion emerge from her neck just as Chrysaor had done. The stallion walked up to me and nuzzled my hand before turning away. And, then I watched in awe as the first Pegasus spread his wings and took off into the sky. And to this day, Pegasus, that beautiful winged stallion whose birth I was so lucky to witness, remains in the starry sky. This article is by Elizabeth, age 12, an Experience Astronomy student from Parker, Texas.